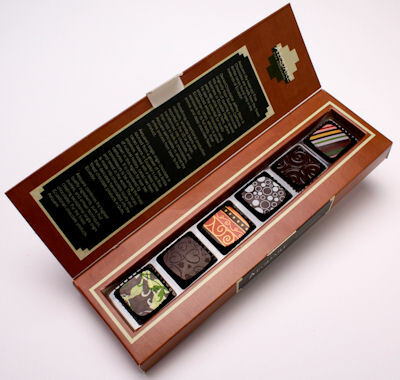 Aequare chocolates have an interesting story about the chef who started the company and how they’re single origin Ecuadorian chocolate and ingredients and blah blah. You can read their website for all that. What you came here to read is how they taste, right? When asked if I wanted a sample of these to review, I checked them out and the answer was an immediate HECK YES. This is definitely my kind of thing. On the other hand, that means I’m a tough customer. Like, to start, I was not all that excited about the Dark Chocolate Cocoa Beans, because I don’t really see any reason to eat cocoa beans. I mean, there must be a reason that humanity invented the elaborate processes that turn them into chocolate, right? Kit Kat isn’t the only Japanese chocolate that comes in interesting flavors that we don’t see much of in candy in this country. 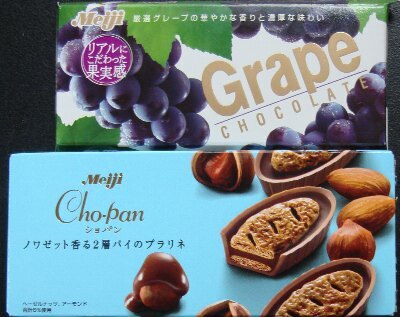 I got to sample two Meiji bars, one with a fairly traditional flavor combo, the other more intriguing. These are little chocolate cups with a crunchy flaky praline filling. There’s supposed to be some cream between two layers of praline crunch, according to the picture on the box and the J-list catalog description. I don’t get much of a sense of cream, but that’s just as well, because I love the crunchy flaky thing they’ve got going here. The only thing I have against this one is that the chocolate is a bit too mild for my taste. I do like milk chocolate, but I prefer it to be pretty dark milk chocolate. But if you’re the kind of person who likes milk chocolate for the very reason that it’s not dark chocolate, you probably will have no objection to these at all. I am a traditionalist about flavor combinations. No, not someone who is scared of new things. Someone who thinks that if chocolate-raspberry has stood the test of time, whereas no one makes anything chocolate-watermelon flavor, there is probably a good reason for that. I’m not positive this is candy, but white and brown sugar are the ingredients listed right after pecans. 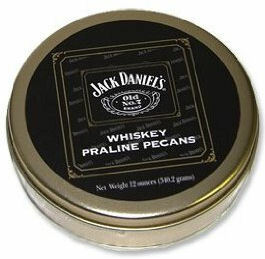 I’m also not sure why you’d think to put whiskey all over your pecans, but hey, I’m game. Okay, I just opened up the handsome tin and got at these little nuggets, and the alcohol aroma is unmistakable. That’s eau de Lynchburg, all right. But how are these brown sugary whiskey nuts going to taste? And should I be eating them before noon? Though I feel my heart is already promised to The Atkinson Candy Company when it comes to Texan candy, I realize there are many other small manufacturers littered across the Lone Star State. Often, I see the products of these other companies near the checkout aisle of drug stores or on the countertops of gas stations. Itâ€™s hard for independent companies to afford shelf-stocking fees, so I assume this localized display is one of the few ways they can afford to compete with the big three. On a trip to a Walgreens, I spotted this tiny, square praline piece of candy in a wicker basket. Truthfully, I had come to buy a bag of Twix, but this cellophane-wrapped candy seemed like the dog in the pound nobody adopts because itâ€™s not a purebred. Well, there was no way I could let this mutt/piece of candy just sit there. It needed a good home/stomach. 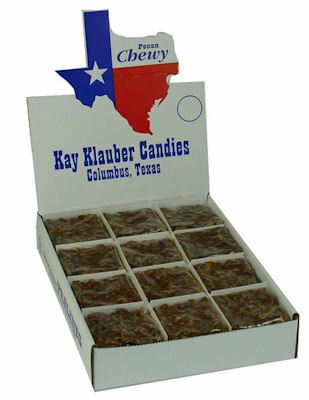 The candy turned out to be called a Chewy Pecan Praline, which is manufactured by the Kay Klauber Candy Factory from Columbus Texas. I had a good feeling about this candy right away. I have always been charmed by candies whose names nonchalantly tell you exactly what youâ€™re about to eat, instead of trying to trick you into purchasing them with some brand name that is never as tasty as the name implies. Go ahead and twist my arm. Make make me review Toblerone’s One by One, a tasty treat manufactured by one of my favorite chocolate companies. In fact, make me review the One by One assortment as often as you like. These little chocolate pyramids are every bit as delicious – and in some cases even more so – as their better-known bigger cousins. Remember those dark days when you could only find Toblerone candy in an airport’s duty-free shop? Well, we’re living in enlightened times; those dang delicious bars are everywhere now, from your local gas station to the supermarket down the street. But that doesn’t mean that the candy’s quality has diminished. Toblerone bars are still made in Bern, Switzerland, where they have been produced since 1908. It’s true that nothing is better than Toblerone’s super-sized 10-lb. jumbo bar, large enough to knock a home run not only out of the park but into outer space, too. For more modest appetites, though, Toblerone now offers the â€˜One by Oneâ€™ five-variety pack. This pack contains a treat for every rabid Toblerone fan: snack-sized individually wrapped triangles of five versions of the company’s chocolate. The mini-review? Each variety has its own charms. Some are outstanding. Others are a bit below average. But it’s like buying a greatest-hits album: you’ll love some songs, and you’ll tolerate them all.